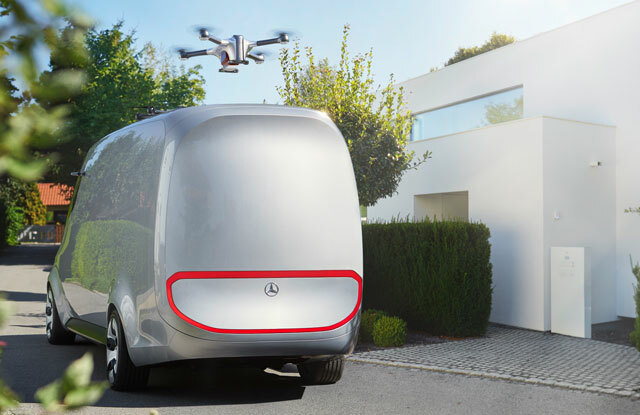 Mercedes-Benz is looking at mounting automated flying drones onto a new line of electric vans as part of a €500m (R7,9bn) investment aimed at speeding delivery times for online orders. The small, pilotless aircraft would be part of a suite of on-board systems, including digital sorting equipment, that could cut both costs and delivery times in half for the final portion of a package’s journey, the car maker said Wednesday at a presentation in Stuttgart, Germany. The two drones can each fly items weighing as much as 2kg as far as 10km, enabling service to difficult-to-reach to places. The concept is among the Daimler unit’s efforts to help corporate customers speed product transport as volumes rise because of the boom in electronic commerce. Deutsche Post’s DHL division and United Parcel Service are also looking at how to ensure items are delivered on the first attempt even when the consumer isn’t home. Online retailers such as Amazon.com are experimenting with handling deliveries themselves. The investments will be spaced over five years. Mercedes didn’t outline a time frame for when the drones or technologies like a robotic arm for sorting parcels inside the van might become commercially available. Many industries are researching potential uses of drones beyond dropping the latest Internet shopping on people’s doorsteps, such as railroad-track inspections, spotting criminals on the run or organ delivery for hospitals, though a regulatory structure for the aircraft is still in its infancy. “The growth in transportation means we have to change our processes accordingly,” said Stefan Maurer, head of Mercedes’ future transport systems for vans. 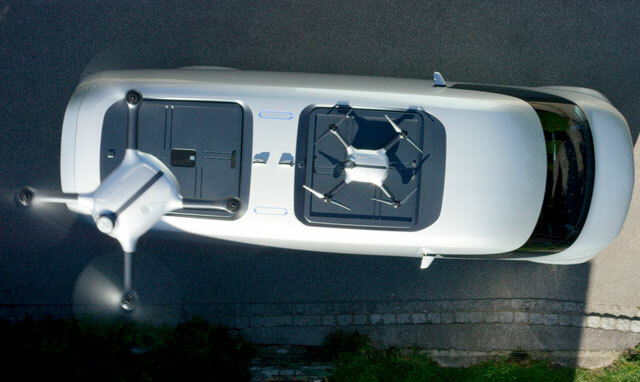 The drones on the Mercedes concept are fixed to the van’s roof above a hatch that opens to the vehicle’s inside. Made of carbon fibre and aluminium, the mini-copters with four propellers measure about 55cm across. The aircraft were developed jointly with Swiss partner Matternet, and similar models have already helped carry medicine to people in difficult terrain, Mercedes said. Police cars with drones like this would make a hell of a lot of sense. Then it saves the trouble (and cost) to get a chopper in the air to have an eye in the sky. Rugged design, vertically down facing high-res camera built right into the chassis, as well as a forward facing gopro quality camera when they have to persue suspects visually into areas with cover. Or a high quality 360 camera so they can be operated using an HMD.